“Blogger’s block” may sound cute, but it’s probably just about the last way you’d want to start your workday. In the last section, we gave you a list of strategies for coming up with new material for your blog. But even if you find that you’re not at a loss for topics now, you might be getting bored with presenting that material, again and again, in the form of standard blog posts. So maybe it’s time to consider doing things in reverse: starting the process with a formal constraint for your post. In other words, choose a type of blog post, rather than a specific topic, and see what material it invokes for you. Remember that your resources list shouldn’t be self-serving. 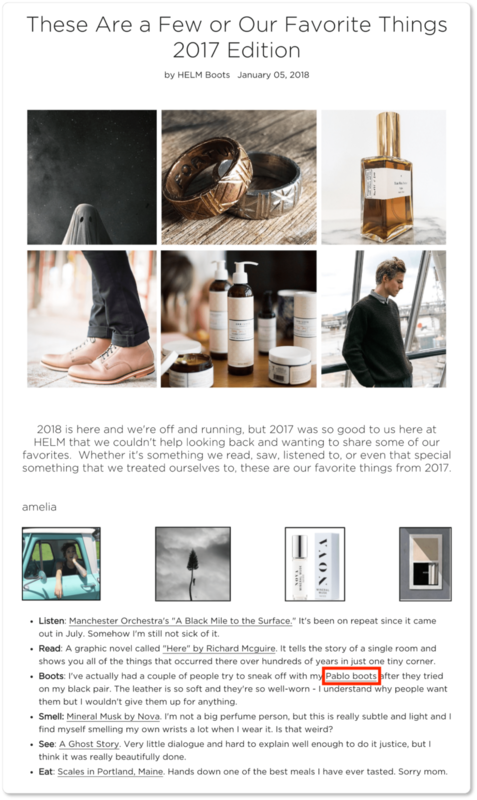 While Amelia does mention her “Pablo boots” (a boot Helm makes), the rest of her list offers lifestyle content that isn’t there to financially benefit the boot company. 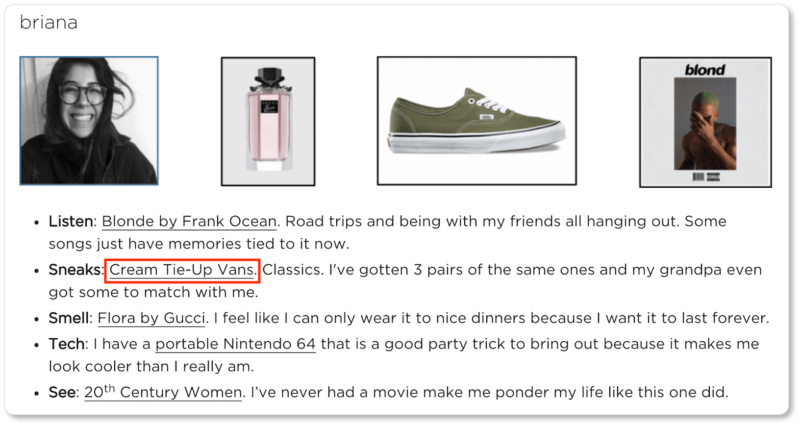 Indeed, the list that follows this one was written by Briana, who gave a shout-out to Vans, despite the fact that she’s writing for another shoe company entirely. Whether you’re reviewing products, services, conferences, books, podcasts, or another form of media you think is of value to your readers, your blog visitors will respect you as someone who is thinking critically about every aspect of your industry. The “response” post is often a response to another blog or article posted by someone in your field. It’s a way of keeping a conversation going across businesses in an industry. You might gently disagree with the original post, or feel you have something to add, or want to reflect further on the topic. This strategy is a great social media practice. It’s good for SEO since you’re linking out to an authority’s site; and it may very well strengthen—or even inject life into—the broader industry community. These will imbue your blog with a variety of voices, positions, and points of view. They can also serve as social proof if the guests you interview are celebrities or experts in your field. What’s more, they give your visitors—who might not otherwise have immediate access to you—a sense of your personality, based on the kinds of questions you ask and the ways you respond to your interviewee. Interviews also give you the option of incorporating multimedia, as they can be presented as audio, video, or text. Pro tip: If you post audio or video, include an accompanying transcription. Google’s bots can’t “crawl” audio or video; and, of course, you’ll want to keep SEO in mind. We all innately crave stories. We connect with them more than we do just about any other mode of communication, and they evoke our sympathy like nothing else does. The story doesn’t have to be grand—and it doesn’t have to span your entire blog post. You can position it at the beginning of a post by opening with an anecdote, a flashback, a conversation you overheard, what happened on the train on the way to work this morning and how it’s a metaphor for your industry, what was being discussed on the radio as you pulled into the parking lot and how it relates to your service… you get the point. We live out a thousand stories a day; and many of them will be blog-worthy. That’s not to say that longer stories can’t be used either! 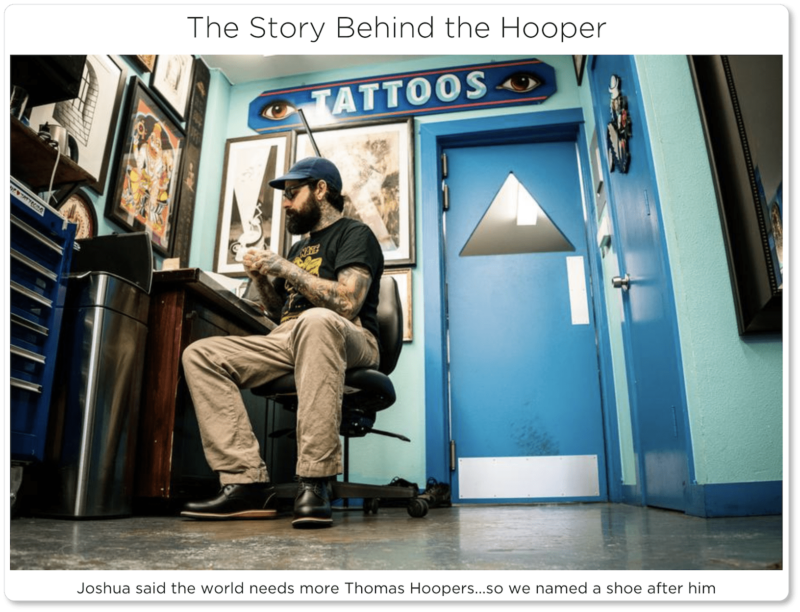 Case studies are excellent material for posts; so if you have customers or clients who are willing to let you tell their success stories, thank them profusely and start writing. If you have your own, don’t hesitate to tell it. Let your visitors know you’ve got a little fire in you and play devil’s advocate now and again. 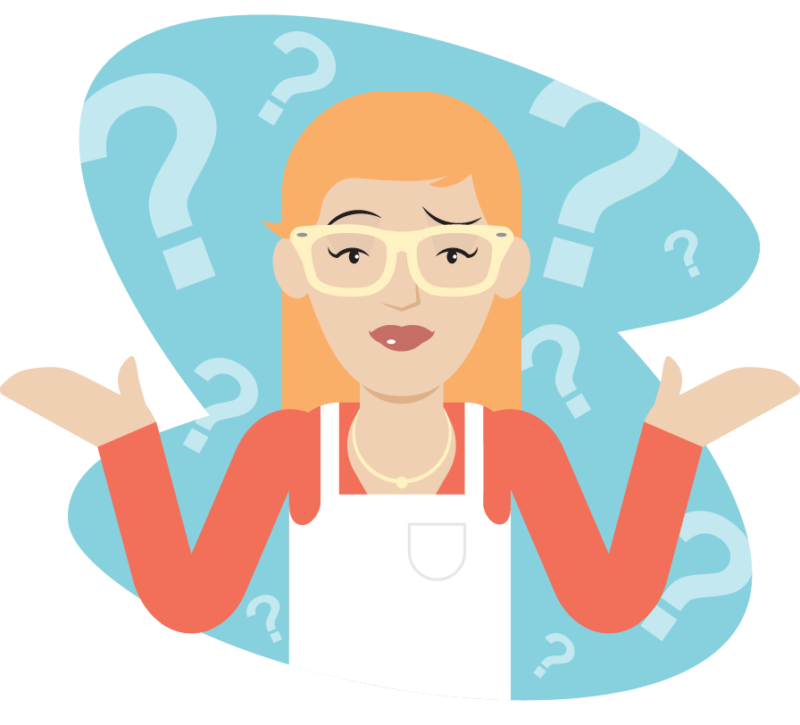 These posts might tackle myths, misconceptions, or misunderstandings about your product, service, or industry. They’ll also earn your readers’ trust, as they show that you’re willing to face—head-on—the mistaken beliefs or wrong assumptions circulating out there. There are plenty of blogs out there that are comprised wholly—or at least primarily—of curated content (think Buzzfeed and Huffington Post); and while we’re hardly here to suggest you turn content curator rather than content creator, there’s nothing wrong with presenting someone else’s work rather than your own once in awhile. Indeed, doing so is a great way to give readers insight into whom you’re paying attention to and in conversation with. And curation gets views: According to Rally Verse, 53% of the posts on social media are comprised of curated content, and those posts invite 47% of clicks. Indeed, a majority of marketers say that content curation has improved their customer engagement (51%), their SEO and web traffic (54%), their thought leadership (55%), and their brand visibility (63%). Let these numbers guide you. 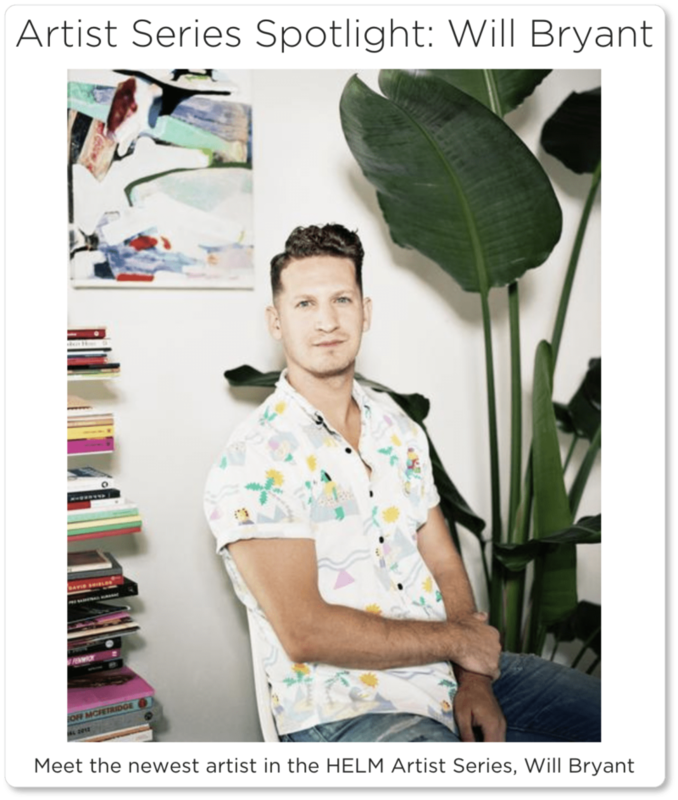 Maybe you curate work from two different leaders in your industry that present opposing views, or two different models of solving the same problem. Get creative and start a conversation with the way you juxtapose others’ work. To be clear, curation isn’t lazy. In fact, it’ll probably take more work for you to comb through what others in your industry are writing about, find pieces by different authors that speak to each other, and write a few paragraphs about why you’re offering these pieces and why they’re important to you than it would to sit down and write your own post. Of course, this is just one possible curation strategy. You might curate a selection of videos, case studies, or webinars. (This kind of curation also falls into the “resources” genre.) Whichever format you choose, always credit the original content creator. If you’re still on the fence about this strategy, check out Neil Patel’s article on “How to Do Curated Content RIGHT,” which lists four compelling reasons for offering more curated content and provides seven types of curated content for you to consider. HubSpot also offers a step-by-step guide on creating curated blog posts. This is yet another kind of curation. Choose guests that you’re sure your readers will resonate with—and, again, who are experts or celebrities in your industry. Don’t hesitate to choose someone who holds different ideas about your product, service, or industry than you do. This will just give you material for a follow-up blog, where you can reflect upon those differences and model inclusiveness for your readers. Of course, you’ll be keeping a consistent finger on the pulse of your readers, paying attention to what formats they respond most strongly and positively to. What kinds of blog posts get the most comments? The most shares? These things, ultimately, are what will guide you. Just don’t fatigue your readers with predictability. Providing content variety will keep readers engaged and coming back. It’ll also differentiate you from your competitors, who may still only be offering standard, text-based posts to their readers. Between our tips for writing killer blog posts, our strategies to generate ideas for those posts, and this list of blog post types, we’ve got your content covered. Now it’s time to think about the aesthetic elements of your blog posts. In the next section, we turn to your posts’ featured images, and offer best practices for these decisive visual elements of your blog.